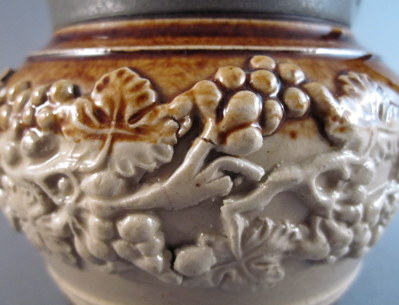 This small sprigged baluster form stoneware jug is decorated with applied vines of grapes around the middle and impressed leaves along the rim. 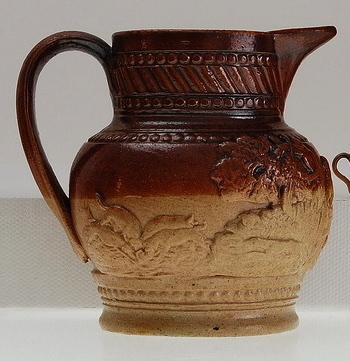 A wash of brown glaze covers the top half of the jug. 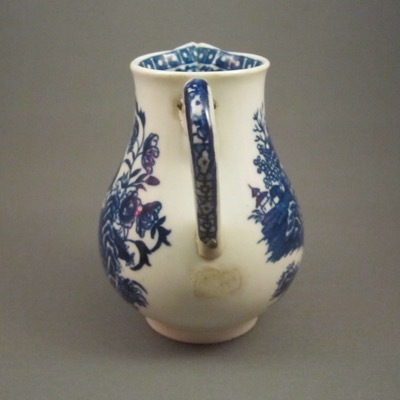 It was made in England in the mid 1800s, most likely in Bristol or Chesterfield, and measures 3.25 inches high and 4.5 inches from handle to spout. 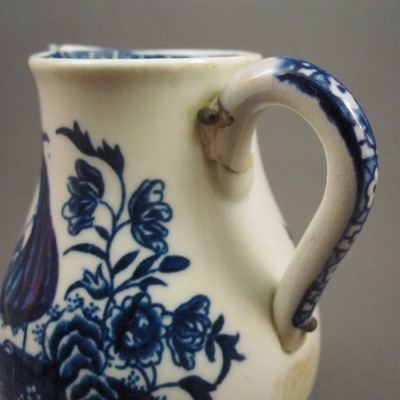 Sometime in the late 1800s to early 1900s, the handle became detached. 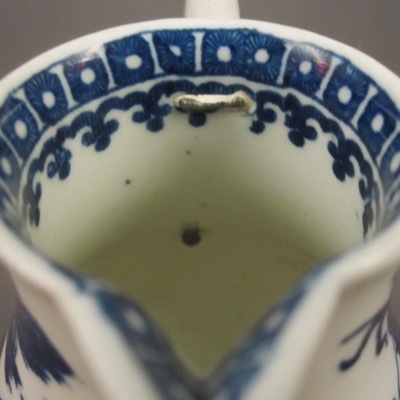 Luckily, the owner found a proficient tinsmith who fashioned a sturdy metal replacement with crimped detailing and horizontal support straps. 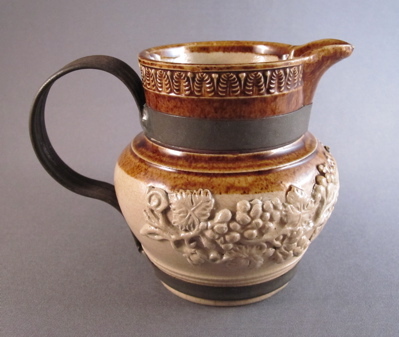 This jug with similar form and glaze shows what the original handle on mine might have looked like. 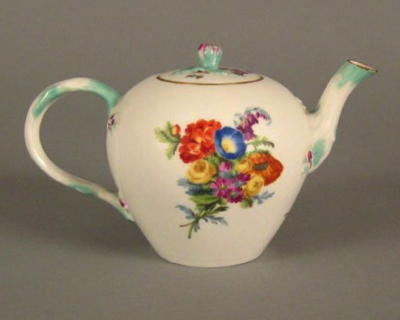 This hard paste porcelain teapot was made at the Meissen factory in Germany during the Marconi Period (1763 – 1774). 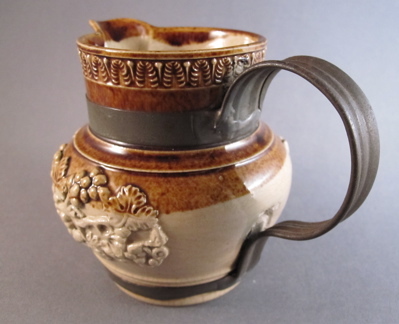 It measures 4.5 inches high and 8 inches from handle to spout. 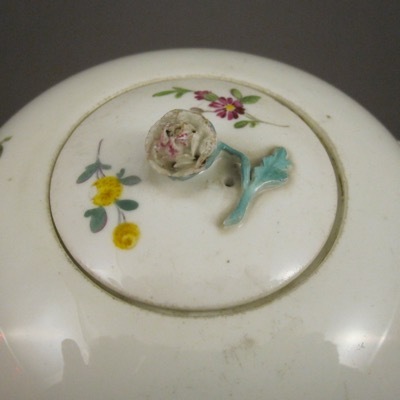 It is decorated in polychrome overglaze enamels with a flower motif on both sides of the pot and on top of the lid. 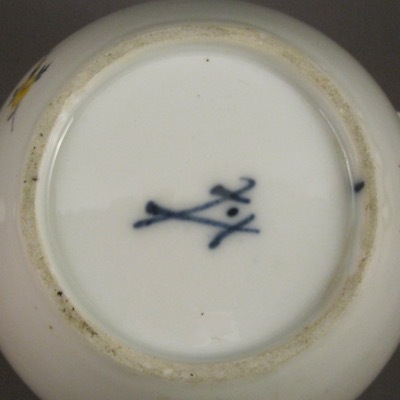 A cobalt mark of crossed swords and a dot can be found on the underside. 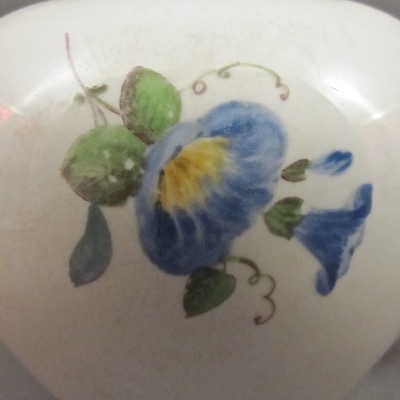 The noticeable surface wear suggests that it was well loved and heavily used over the past 250 years. 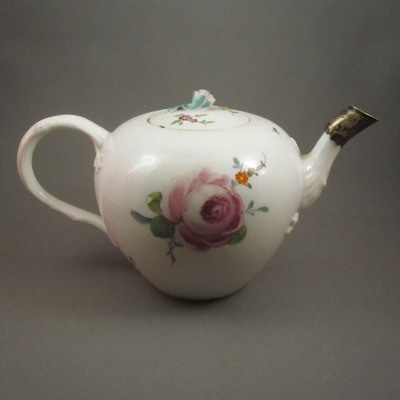 You can guess that this teapot found its way into my collection due to its nicely done silver replacement spout. 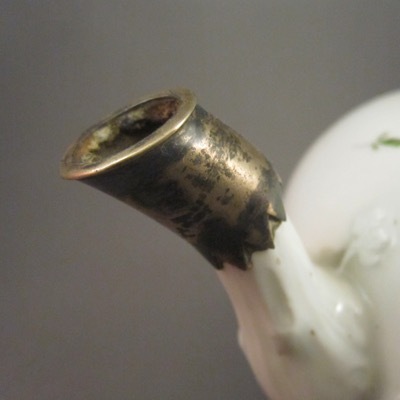 Repairs such as this were commonly done on spouts, as they were prone to chipping. 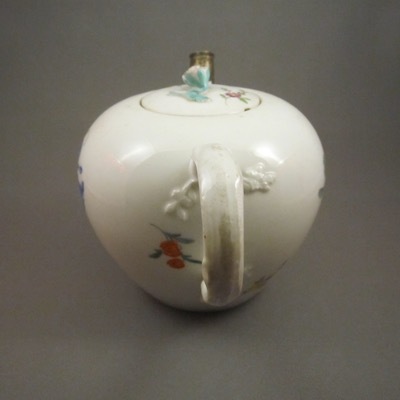 This teapot was owned by a former French teacher at my high school who lives in Brussels and has been an early supporter of this blog. Merci beaucoup, Marienne! 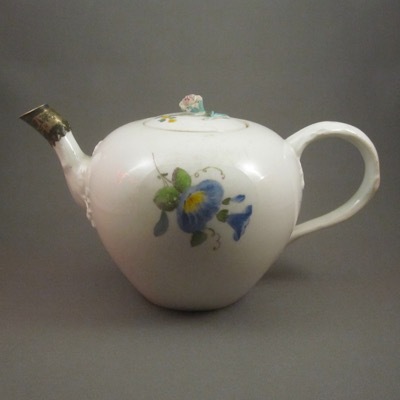 This teapot with similar form and decoration still as its original spout intact. 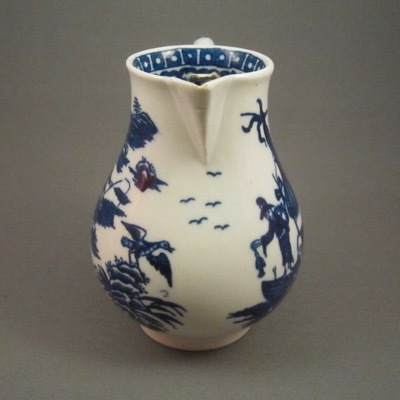 In the small hamlet of Cummington, Massachusetts, home of the esteemed ceramics gallery Ferrin Contemporary, sits the Kingman Tavern Museum, a small historical museum overflowing with antiques of local interest, donated mainly by the town’s residents. 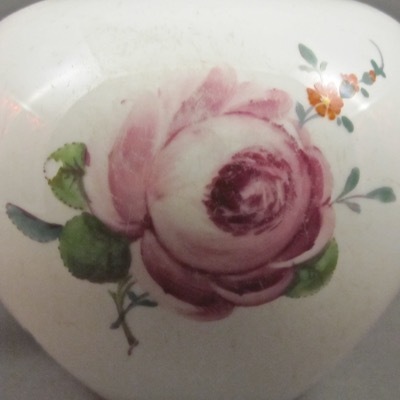 The collection includes a full scale replica of an early 1900s country store, miniature rooms by artist Alice Steele, and vintage clothes, tools, and household items. 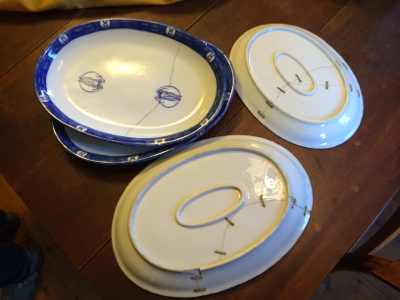 Among them is a curious set of porcelain plates riddled with early staple repairs. 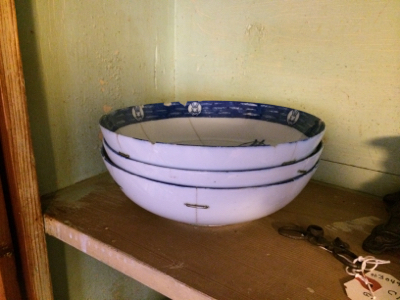 On a shelf sitting alongside a handful of innocuous-looking plates and tableware are two stacks of thick walled bowls and platters, each with pronounced staple repairs. 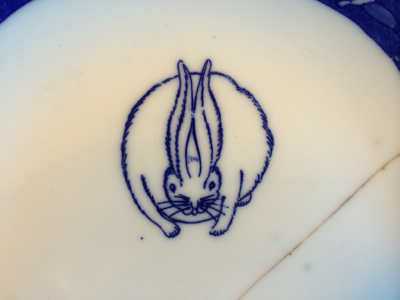 The cobalt blue stylized rabbit pattern is unfamiliar to me but appears to be American, late 19th century, and perhaps restaurant china. No one associated with the museum seems to know anything about the set or how they got there. 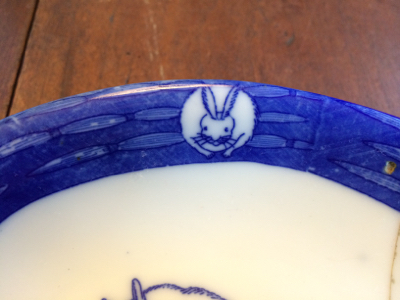 If anyone recognizes the pattern please let me know and help solve this mystery! 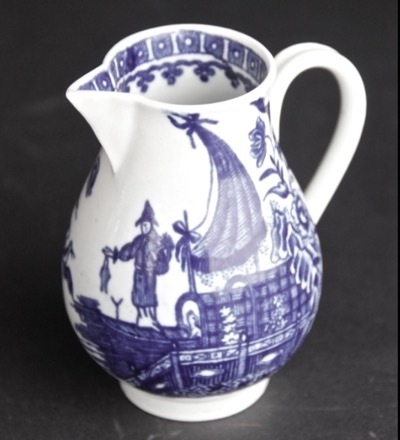 This First Period Worcester sparrow beak cream jug has cobalt printed transfer decoration in the “Fisherman and Cormorant” or “Pleasure Boat” pattern. 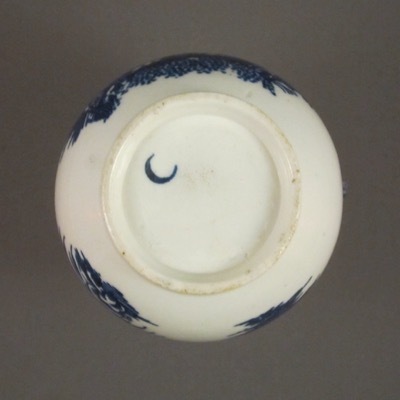 On the underside is a cobalt hatched crescent C mark, used at the Worcester factory between 1755 and 1790. 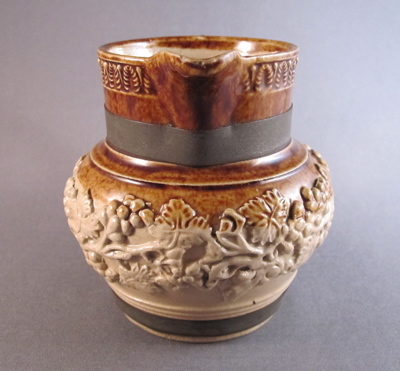 It stands 3.5 inches tall. 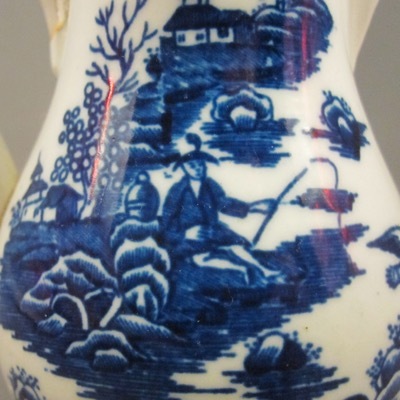 At first glance this small jug appears to have a common metal pin repair to the handle, but upon closer inspection you will see it has a much more interesting tale to tell. 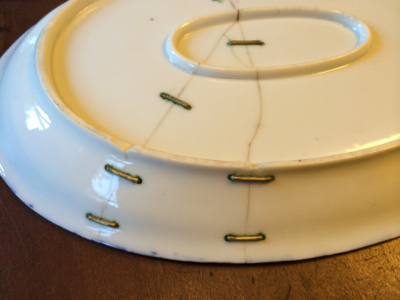 This is a marriage repair: two different broken items that become one unique piece. 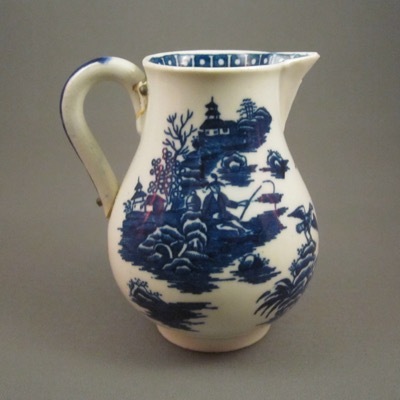 I call this my Bride of Frankenstein Jug, in homage to my Monster Mug, a large Chinese export mug with a replacement handle made from a Mason’s Ironstone Hydra jug. 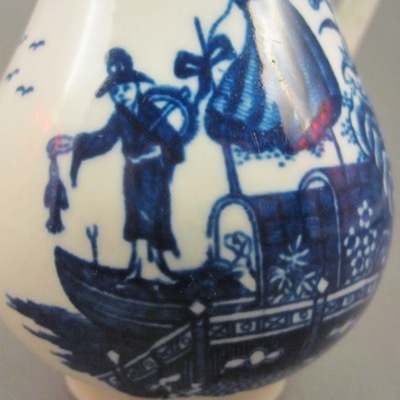 In both cases, rather than a tinker making a metal replacement handle, a crafty repairer carefully removed the handles from damaged jugs and grafted them onto the bodies of these vessels. 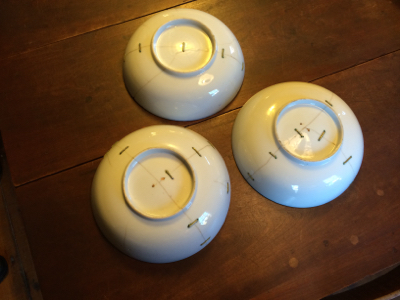 The ground down remains of the old handle are still visible, as the replacement is shorter than the original. 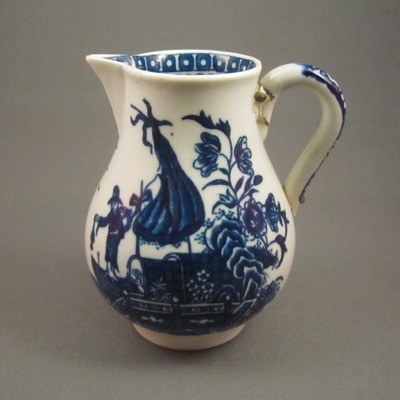 One can only imagine what became of the original broken donor jug, as once the usable parts were removed and used to bring the other jug back to life, its remains were most likely cast aside in a dump, eventually crumbling and returning to the earth. 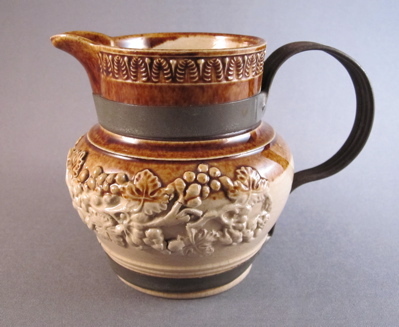 This identical jug shows what the original handle on mine looked like before it became undone.